There’s always a risk in broaching a subject which, arguably, you’re ill-placed to pass comment on and one that is as complex and emotive as the issue of prejudice and inclusivity within football. 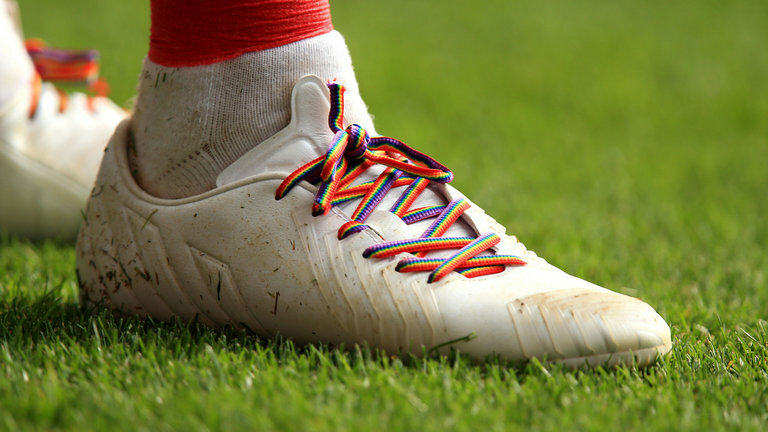 However, on the back of Ian Wright’s two-part documentary ‘Out of Their Skin’ and Norwich City’s support of the Rainbow Laces campaign, it’s very much front of mind. As a white, straight, able-bodied man, I haven’t been subjected to any form of prejudicial abuse in my life, and so I can only imagine the hurt, anger and frustration it must cause. I was called an ‘inbred c***’ by a minibus full of Teessiders, whilst walking away from Wembley, but that was directed at my football shirt and had nothing to do with me as an individual. Nothing to do with my race, sexuality, gender, religion or anything else that I would consider as being part of my core identity. My relationship with football, in its many guises, has been one of inclusion. From my playing days, to supporting Norwich City, through to coaching and writing for this website, I have found a sense of belonging and formed close bonds and friendships. Whether it’s hugging relative strangers in the Barclay after a goal, sharing jokes in a dressing room or mingling with the ‘MFW family’ at our annual writer’s breakfast, football can provide the opportunity to break down social barriers and unite people. But it would be naive and ignorant to assume that my positive experiences are shared by all, simply because I have been sheltered from football’s harsher realities. A naivety which could be borne out of not experiencing the issues first-hand – if you’ve never been on the sharp end of a problem, then what’s the problem? A naivety, that may lead some to question the value or purpose of the campaigns and supporters’ groups which champion inclusion and equality. An ignorance that can lead to a national sports presenter mocking an official’s capability based on gender and dismissing it as “just banter”. The ignorance of offensive terrace chants that emanate from the relative anonymity and ‘safety’ of a large crowd. Wright’s documentary focussed on the pioneering role black footballers have played in changing football’s culture and was both up-lifting and harrowing. Among the contributors was Paul Canoville, the first black player to appear for Chelsea, who described how he was racially abused by his own fans as he prepared to make his debut off the bench at Selhurst Park. “All that joy in me, that excitement was taken away just like that”. Clearly there has been progress since those times and with the increase in players of Black, Asian and Minority Ethnic (BAME) backgrounds throughout the domestic leagues and International squad, players are rarely referred to or identified by their ethnicity. However, since 2000, whilst the proportion of black footballers playing for England has risen significantly, only 10 per cent have been given a managerial job following retirement, compared to 25 per cent of white players; a statistic that is suggestive of deep-rooted and institutionalised issues within the game. The ‘Let’s Kick Racism Out of Football’ campaign was established in 1993 as a small independent charity, in response to widespread calls from clubs, players and fans to tackle racist attitudes existing within the game. Kick It Out was then established as a body in 1997 and widened its objectives to cover all aspects of discrimination, inequality and exclusion, including homophobia. A survey carried out in 2016, found that 72 per cent of football fans had heard homophobic abuse while watching live sports in the past five years. More worrying is the fact that this represented an increase on a similar survey conducted in 2009. But it would be wrong to suggest that this is solely ‘football’s problem’. Football’s culture is a microcosm of the wider societal culture and a lens through which to view underlying values and beliefs. Whilst society has changed what is widely deemed acceptable to say and how to act, the concern must be that certain fundamental beliefs remain ingrained. Beliefs that are largely held in check (by what some consider to be ‘political correctness, gone mad’), but which are seemingly being expressed in ever increasing environments, including sport. Genuine and sustainable change will only be brought about by addressing those beliefs. And therein lies the real value of Kick It Out, Rainbow Laces and documentaries such as Out of Their Skin. Not to prescribe or define what is considered to be acceptable, but to raise awareness of the issues; to challenge thinking; to educate; and ultimately, to make the game we love, genuinely accessible to all. In 1993 when the “Lets Kick Racism out of football” slogan was adopted, there were a few clubs in the PL which rebelled slightly as they believed there wasn’t an issue at their club. Bit of a head in the sand moment no doubt. Norwich (primarily Mr Chase) was one of those few clubs – I clearly remember reading an Evening News article about this at the time. As a compromise, the slogan for those few clubs was subtly changed to “Let’s KEEP racism out of football”. If you see pictures from Carrow Road around that time, you’ll see it. Good to see that times have changed and all aspects of racism and not being ignored from within the clubs at least. I think you’ve got this issue absolutely bang to rights. I’m 61 and both racial prejudice and homophobia (nobody called it that then) were alive and “well”, at least in East London where I grew up in the 1960s and early 1970s. Dad, a policeman, told me from an early age that we are all the same and to live and let live – without prejudice. Not all that easy sometimes wayback then when the likes of Enoch Powell were in full flow. Move on 50 years (or almost two generations) and the attitudes of my entire generation have completely and quite rightly changed – apart from the odd dinosaur stuck in a swamp somewhere. My adult children (both late 20s) never considered sexuality an issue worthy of discussion in their formative years and still don’t today. In fact the headmaster of their primary school decided to publicly come out during some event I’ve long forgotten – neither a pupil or a parent batted an eyelid. Nowadays I don’t think anyone gives the proverbial monkey’s about sexuality and so it should be. Football of course is different but there’s a great new article by Di Cunningham floating around featuring our very own Christoph Zimmermann whose comments make for great reading. I’m not totally convinced it’s quite as simple as that. One of the reasons that we have a big increase in the proportion of black players is that many arrive via European clubs e.g. in France, Belgium or Holland. And in many cases they leave again before their playing career is over. Furthermore if they want to go on coaching courses they will probably do that in the country they learnt the game in, with their pals there and in a familiar language. But even if their final club is here, I doubt if many stay in the UK after retirement. Even if they do they don’t have long-standing roots/contacts to help them out. So the pool of potential black coaches and managers is probably not as large as the pool of players suggests it should be. In general terms though it’s not a surprise that football has a problem. For many fans a big part of the game is despising people simply because of where they come from – which, like the colour of their skin, is outside their control. Hating people because they are “different” is as much a habit as anything else. If somebody is brought up to believe that it’s fine to hate someone because they happen to come from Ipswich, it’s not a big jump to the idea of hating someone because they are of (say) African descent. But one thing’s for sure – my nearest club certainly clearly don’t have any prejudice – Paul Ince, Keith Alexander (RIP) and now Sol Campbell have all taken on the role at Macclesfield. Yes, but the quote and the statistics are about black players who played for England and not those who “arrived from Europe”. So the logic that you use to try to defeat that statement is incompatible. A vary good read and the mentiobed program well wirth the tine to watch. Having spent the majority of my working life overseas racial abuse isn’t confined just to our own shores, and being a proud englishman found certain parts of the world where you needed to have thick skin Aberdeen, Glasgow to name two close at home. Kick it out seems to do a good job and they make it known they are looking into racially abused people not only in football but other sports but I once read that a white sportsman had no one to report abuse to due to being white he was told it was banter whites don’t get abused ?????? Playing football I once got called a white bas—- C— my reactions was a simple retort saying if that is true you being your colour you are the same not so politely after the game he said he was trying to wind me up again I replied if I had said that to you first you would have reported me for abuse he smiled and walked of. Some majority groups are there own worse enemy and yes the game needs to move on but in what ither industy is there a continuous report being published on how many black managers have been employed, how many have been interviewed and how many have got theur coaching badges people should get a job in any walk of life on merit not colour, sexuality, religion or gender. Rescently Sol Campbell got his first managers job and I wish him all the best but he is a controversial figure last year he was quoted as saying that a premiership club would employ him due to his colour not lack of experience, when big Sam was sacked again he was quoted as saying if he was white he would have got the England job, now he is being ridiculed by suporters of his new club after his TV interview. They are 3 from Campbell news conference and lets hope he proves he is other wise he will help to put other clubs off recruiting ex black players into management, clubs will shy away from all the media cover he will generate, it will not be he failed but the club failed in backing him.